Intel IT is transitioning to an enterprise private cloud that will support our office and enterprise computing applications. This cloud is based on virtualized infrastructure accessing shared pools of storage through storage area networks (SANs). 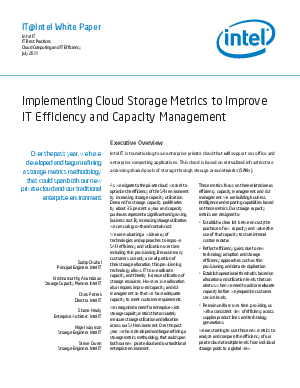 With demand for storage capacity increasing at 35 percent a year and storage capacity purchases representing a significant and growing business cost, Intel IT has developed and begun refining a storage metrics methodology that is helping us improve efficiency, actively manage storage capacity and minimize business risks. Explore Intel's IT best practices for managing cloud storage environments to create business value inside an enterprise private cloud environment.